Eighty years later we know that Aalto had a piece of furniture in his hands, which would be sold millions of times by Artek. The simple, stackable stool out of wood represented new functionality approaches in furniture design. Alvar Aaltos work was embossed by Scandinavian classicism in the beginning of the 1920s, but along the decade, he was more and more interested in rationalistic and standardized constructions. Aalto always considered furniture part of his architecture and this is how he started to cooperate with Otto Korhonen, the director of the furniture factory in which Aalto produced his legendary Paimio furniture. Otto Korhonen was experienced in working with wood, especially with the Finnish birch wood and in applying different processing methods. Aalto’s designs referred to the Bauhaus embossed furniture, while the usage of wood instead of bent steel tube was considered revolutionary then. 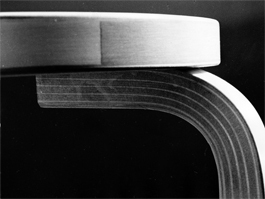 Aalto and Korhonen optimized the wood-bend technique together, since Alvar Aalto also aimed to produce aesthetically appealing end-products for serial productions. In 1933 they achieved in bending massive wood for table and chair legs in an L-form. The legs of the stool were directly fixed with screws under the seat of the stool, so that it wasn’t necessary to use conventional wood connectors by carpenters. Now Aalto was able to produce his furniture in series and the success history of the Stool 60 went on. 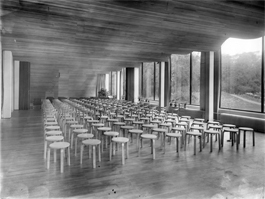 As well as most of his products, Aalto designed the Stool 60 to furnish a building he created himself as an architect: The library of Viipuri, Wyborg today. The Aalto stool had three legs in order to be stackable and remain functional – an indispensable advantage for public buildings, which also convinced private people then and today. Artek presents an anniversary edition of the stool, which remains of its functionality with the colours, according to the 80th birthday of it. The Alvar Aalto 1928-1933 designed Paimio Sanatorium served as inspiration, since the yellow ground, the green walls, the turquoise banister and walls as well as the orangem white and black of the furniture are repeated in these new editions. Artek furthermore presents a special edition as birthday surprise: Different artists and designers created an exceptional look for the classic stool in the event of the anniversary. The Japanese Nao Tamura for example, brought the cutting of an 8o years old tree to the seat: Every year’s ring tells an independent, special story; or Mike Meiré, who completely re-interpreted the colour thematic, ensuring individuality and vivacity. It proves: Artek’s Stool 60 isn’t old at all. 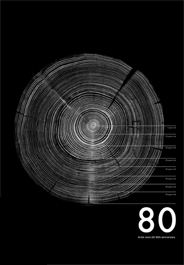 So there is only one thing left to wish for the Stool 60: We look ahead to the next 80 years!